I've been enjoying this past week of sunshine. I was able to wear this skirt with no tights! I found this pretty, chiffon-pleated skirt at Forever 21. I'm always drawn to lace; whether it's a lace hem or an entire lace piece-it's beautiful and feminine. Needless to say, I was excited when I found this gem. I can't wait to restyle this skirt with so many other outfits. This skirt is a great addition to my closet and I'm excited to wear it again! Looking lovely . 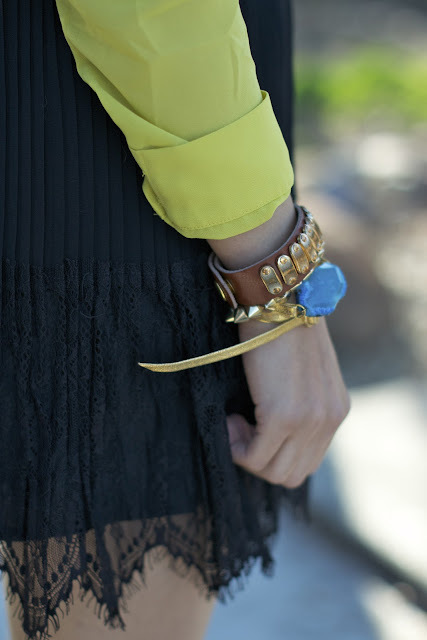 Forever 21 is one of my favourite brands and this blue stone bracelet is totally catching my eyes . Just love how you paired that hat with those boots! So pretty! You look Gorgeous! i am so in love with your top! hope you'll check out my page. I love the skirt and the lace. I'm so obsessed with Lace lately! i love this outfit! i just found the cutest shorts in the world at winners.. not really lace trim, more like a floral cut out.. anyways, so cute! i love the sunny yellow on you!